Some may shake their heads and say that I should not use magic as an explanation for an inexplicable wine. That there are purposeful and complex reasons and efforts that go into making a wine what it is. That it is useless and even dishonest to indulge in mysticism. 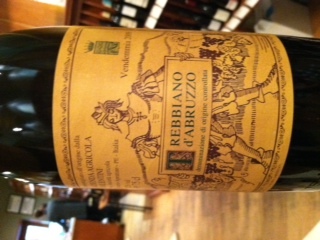 Even so, I believe that Eduardo Valentini’s Trebbiano d’Abruzzo is magic. Famously secretive about his practices, more than hesitant to host visitors, and totally ambiguous about the idea of pleasing palates or selling wine, Valentini made cryptic cool. The world lost Valentini in 2006, though production continues at his family’s estate in the region of Abruzzo’s village of Loreto Apruntino. But for one living soul (Eduardo’s son, Francesco), no one in the world knows what goes on at Azienda Agricola Valentini. We can only speculate- whether Valentini whispered to his vineyards, performed pagan ceremonies, or just had distinctive vines and ridiculously good luck. We do know a few things about his facility- that it houses an old basket press, glass-lined cement tanks, and large used oak botti. We don’t know if or when or how they are used. We do know that the property has about 170 hectares planted to vines, and that only certain bunches of the grapes harvested, selected from different areas of his land each vintage, are used in Valentini’s wines. The remainder of the harvest is sold off to a local cooperative. We don’t know which one. Over a year ago I had the opportunity to taste a vertical dating back to ’92. Every wine, no matter its age, tasted similar. Such youth coming from Trebbiano, a typically less than remarkable grape. Tomato leaf, white truffle, and the loveliest most delicate yeast- this wine makes you feel as though you have lived a lifetime in a moment, answers questions you’d never know to ask, takes you dimensions past joie de vivre. It does for me at least. Valentini’s wine is imported to the states by Domenico Valentino. Not much is produced, so any vintage that you come across is recommendable ( 2005 is very nice). If you can spare the cash and come across a bottle, take that trip, it is so worth the ride.